With Father's Day just around the corner, there's a good chance many Americans are asking themselves the familiar questions: What does dad want? What does my father need? How should we best celebrate dad this Sunday? YouGov BrandIndex's Recommend score, which asks respondents if they'd either recommend a particular brand to friends and colleagues or tell them to avoid it, reveals the brands US men with children under the age of 18 are currently telling others to get. So, if looking to buy a gift for dad this Father's Day, why not start there? 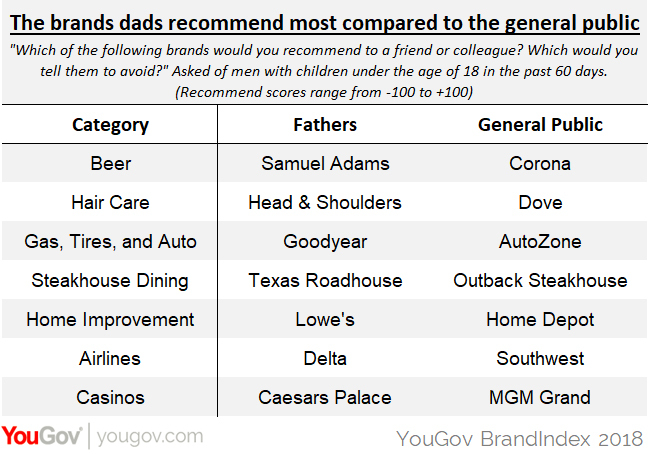 As the figures show, men with children under the age of 18 are most likely to recommend Samuel Adams, while members of the general public are more likely to advise friends and family to try Corona. For hair care, dads presently encourage others to use Head & Shoulders more than Dove. The same goes for Goodyear over AutoZone, and Texas Roadhouse over Outback Steakhouse. Additional data from YouGov Profiles indicates that 77% of men with children under the age of 18 agree with the following statement: "A gift is an expression of how special someone is." Only 15% disagree.